Doing sport is better off with good music on. Jogging outside or lifting weights in the gym with music on feels more right and stimulates productivity. That’s why having a reliable pair of sports headphones is essential. 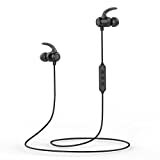 iClever XFree Mini Magnetic Bluetooth Headphones are surprisingly lightweight and portable In-ear Headphone suitable for Sports and Gym Activity. Furthermore, the manufacturer promises that they were packed with the most premium features in order to ensure the impeccable performance. Spending some time with them, we learned about these features and tested them. In this review, we will unveil the results of these tests and highlight their main peaks, but also drawbacks, if there are any. The use of the wireless headphones is extendedly increasing. For the needs of sports, many people prefer being free of wires and thus of inconveniences or accidents. iClever XFree Mini streams the music over the latest technology of Bluetooth v4.1. The apt-X codec is an unavoidable technology in providing a rich and dynamic bass, along with the wide soundstage. Bluetooth on these headphones offers a strong and steady connection. The connectivity process itself takes less than a minute. Additionally, music is effortlessly streaming from the phone even while it’s in the pocket. As in this case, the connectivity range is around 33 feet (10 meters). With gyms and the sounds of the street being overwhelming at times. The manufacturer invented the CVC Noise Cancelling technology in the iClever XFree. The version 6.0 does a superb job at making you discreet with your favorite music. The technology works consistently and closes down 90% of the outside noise. The CSR chips and inline microphones reflect the outside noise and channel it away from the ear. If you are listening to the music in the public transport or plane, rest assured that nobody else will hear your music. Understandably, they are earbuds but we found iClever XFree very reliable in terms of noise cancellation. We decided to test the headphones for the water resistance while working out and listening to the music. We all sweat and this time, it wasn’t an exception. The headphones have endured well and nothing seemed to be malfunctioning. This is the result of aircraft aluminum design and durable build that we will take a grip of in the design section. So far, as we understood the manufacturer, the headphones will endure well even in the rain. This gives us a conclusion that headphones will only give up in case of massive splashing, so don’t think about throwing these in the water. As much as it sounds exciting, these headphones don’t get along with water sports. iClever XFree offers a consistent list of features. However, we consider the surrounding competition stronger at them. We give iClever XFree 4 out of 5, though that certainly doesn’t make it a bad headphone to start with. When it comes to design, there is a lot to say. Upon a closer look, we saw that iClever XFree is intelligently built and designed. In fact, despite being an ear bud type of headphones, we are inspired by the lightweight construction manufacturer offers. Headphones weigh only 0.5 ounces (13 grams), meaning that you won’t even notice it. Let’s take a look at the other features in terms of design. Like we mentioned above, the headphones are fully constructed from aircraft aluminum housing. We are quite proud of that, given that the vast majority of waterproofed headphones host the plastic housing. However, not iClever XFree Mini. After careful testing, we assured ourselves in the headphones durability. They flap during training and our activity and we are satisfied with the durability even after the applied force and pressure. The headphones promise uncompromised sturdiness. But, don’t overdo with the abusing, nothing is indestructible. The headphones are equipped with the ergonomic frame that ensures that the headphones safely attach to your ears and stay there even during the most intense workouts. It is important to note that the manufacturer ensured that the buds fit your ear, which is why there are three different types of earbuds. The silicon fin fits comfortable to the ear. Like mentioned, regardless of the size. Additionally, they will nicely snug without causing inconvenience, headache, dizziness or cause your ears to sweat. Inside each headphone, there are magnets that can clip together. This feature is useful for those who eventually get tired of listening to the music and want to rest headphones on their shoulders. This also helps ensure the durable storage, the headphones won’t wave around and get damaged. Moreover, we are sure that the earbuds look like a stylish fashion detail, wrapped around your neck. iClever XFree is a masterpiece in terms of design. We are enjoying their durability so far. And we find the nano-fiber very thoughtful in order to preserve the headphones and sports spirit from rain and sweating while keeping the lightweight and durable aluminum construction. The headphones are enough comfortable to be worn for extended amounts of time, thus we don’t see a reason not to reward them with 5 out of 5. We saw that either design and features are rich and useful, especially the waterproof feature. XFree is equipped with everything necessary to be considered a decent headphone. But, it is the performance that makes us decide whether is a certain pair of headphones worth it. In the further lines, we will focus on sound performance, controls, and battery life. For true audiophiles, the sound quality is the most important information they need from a headphone. Despite being a budget headphone, iClever XFree surprised us with dynamic and punchy bass. It is mainly because of the apt-X and CSR chips, but also the 8mm dynamic speaker that produces a distortion-free, prominent mids and rich treble. The sound quality is appealing especially to those who cherish detail and accuracy above all. Most budget-friendly models aren’t proud of their flimsy controls. With the knowledge that they rarely don’t break, iClever XFree was developed with a durable and sturdy remote control. The manufacturer promises that each one of them was exposed to a 20,000 clicks test to make sure they can withstand the pressure. The keys are responsive to our gestures. Aside from blue LED indicator, the volume up and down controls share the button with the next and previous song commands. In the middle is the Bluetooth button, which is turned on and paired with the mobile phone in the environment. Of course, the remote ensures a hands-free call making thanks to the CVC-equipped, noise-canceling, in-line microphone. Calls we made were sufficiently loud and clear. Despite the noise from running or gym, we succeeded in maintaining a hearable and understandable conversation. Being noise-canceling, microphone isolates your background, allowing your interlocutor to hear you perfectly. While it takes only 1.5 hours to refill its’ juice, batteries that the iClever XFree is equipped with aren’t promising the uncompromised performance. Depending on usage, the battery is able to withstand 8 to 10 hours of playtime with the volume hitting only 50%. Unfortunately, that makes iClever XFree fall back behind the competition with the similar price range. The vast majority of Bluetooth earbuds promises 15 to even 25 hours of consistent battery life. Make sure to be cautious with your music and you won’t have to worry about the battery running out of juice. The battery is a let-down. As such, we award these headphones with 4 out of 5. Finding an uncompromising model of wireless headphones nowadays is nearly impossible, especially at a normal price. Unfortunately, not everyone can settle for the best. Luckily, iClever XFree is a sub-$50 model worth every penny. It is loaded with a great variety of features that can improve your music experience and allow you to dive into the melodic world you haven’t known before. After our thorough review, iClever XFree belongs to a group of Bluetooth headphones ideal for outdoor lovers with a tight budget. The battery life is barely considered average. After in-depth testing and analyzing, iClever XFree mini magnetic Bluetooth headphones are a great workout companion. In order to ensure a respectable pricing, many models have something to sacrifice. 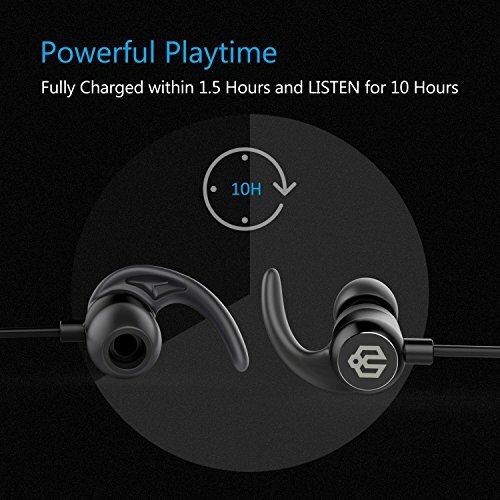 In case of these headphones, that is the battery life. Nevertheless, iClever XFree Mini Sports a lot of valuable features that make it a must-have workout gadget. iClever XFree is a budget, Bluetooth headphone equipped with futuristic features that make it stand out from the crowd of ordinary. Its’ sound performance is uncompromising. 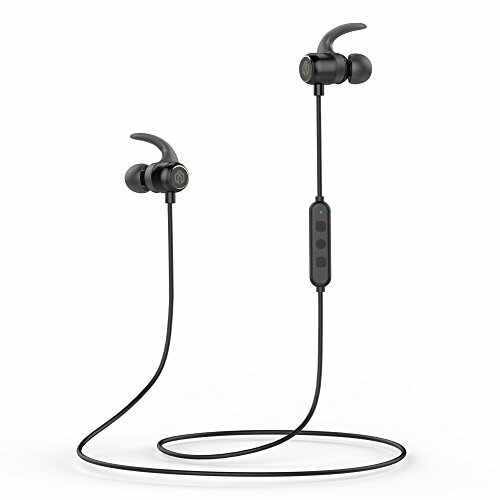 However, worth pointing out are the several features such as IPX5 waterproof feature, Bluetooth 4.1, and CSV 6.0 noise cancellation. Its’ only drawback is the weak battery life, so plan accordingly before taking the headphones on the go.